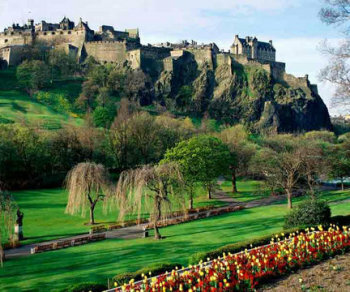 Scotland Capital Edinburgh Has History, The Festival, Night Life and More! 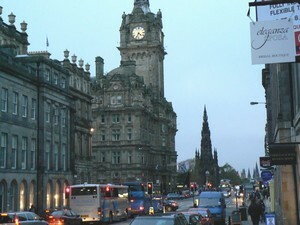 Scotland Capital Edinburgh has been a capital since the 11th century. It is dominated by Edinburgh Castle which occupies a splendid site on top of a volcanic outcrop overlooking Princes Street, (a world class shopping street) and the Scott Monument (A monument to Sir Walter Scott). This site has evidence of having been occupied since around 900BC. 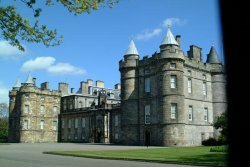 Edinburgh has many fascinations for the vistor, including The Palace of Holyroodhouse(home of Mary Queen of Scots) and Holyrood Abbey, Holyrood Park, the Botanical Gardens, the National Gallery of Scotland, the Museum of Childhood and so much more. The Royal Yacht Brittania (the famous yacht belonging to the Royal family) is now moored there and has become one of the city's top attractions. 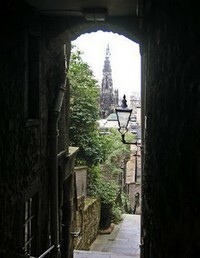 This is a distant view of the Scott Monument seen from a quaint Edinburgh Street. Edinburgh is home to the Scottish Parliament (Scotland also has its own legal system). Since 1999 Scotland has reclaimed its independence with its own parliament and although not all major decisions are made there..it is still somewhat under the influence of Westminster... the new parliament building was opened in Edinburgh by Queen Elizabeth II in 2004. At present the Prime Minister of the U.K., Gordon Brown, is a Scot. more about the Museum of Scotland..
During August the Edinburgh International Festival transforms Edinburgh into an international stage for the performing arts. You can enjoy one of the best international celebrations of music, art, ballet and drama in the world during this great celebration. The festival also includes the Fringe Festival that runs at the same time. 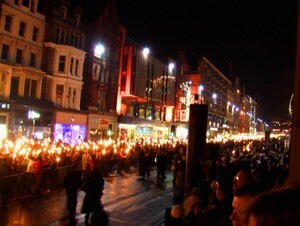 During this period Edinburgh's population doubles and booking for the festival begins as early as April. for more about the Edinburgh Festival click here..
Edinburgh is a cosmopolitan city, with its University and international population. The night life is as exciting as its history and architecture. The other celebration I must tell you about is Hogmanay - and you have never lived if you have not experienced a Hogmanay in Scotland. On 31st December every year, Edinburgh is one big street party with fireworks and the works! Getting around Edinburgh is easy..a lot of it can be reached on foot, (especially Princes Street) taxi or public transport -(the least expensive form of transport), and is a vacation in and of itself.